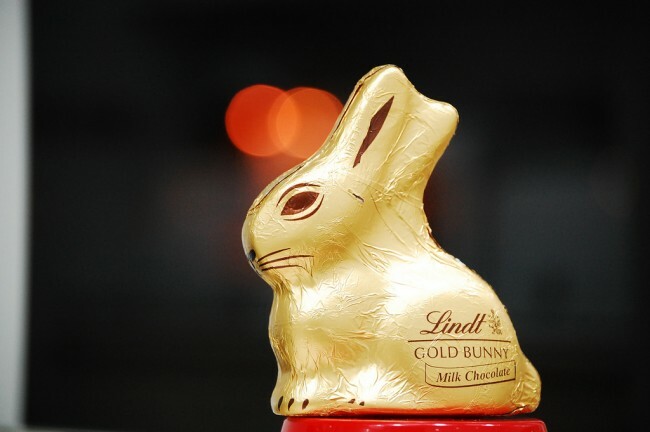 Lindt chocolatiers is hosting their sixth annual golden bunny celebrity auction, to benefit the organization Autism Speaks. The auction which launched on March 10, 2015 in New York City, by host Nikki Reed, who also signed a bunny, is being held on eBay. Bidders get a chance to not only support a great cause, but also bring home a porcelain version of the Lindt gold bunny signed by one of the many celebrity contributors. The 66 celebrities that participated in this year’s auction, come from a number of different industries. These famous personalities include individuals from the world of entertainment, music, sports and even the restaurant industry. Bidders this year can get a bunny signed by Blake Shelton, Dustin Pedroia, Eli Manning, Gordon Ramsay, Harrison Ford and Glenn Close, just to name a few. Previous celebrities that participated in the Lindt gold bunny auction include Donald Trump, Celine Dion, Jay Leno and David Ortiz. The celebrity bunny auction is not the only way that Lindt is giving back to Autism Speaks. In fact, not only does 100 percent of the proceeds for every celebrity porcelain gold bunny sold get sent to the charity, but there are two other ways that the chocolatier is giving back. The first comes in the form of a one dollar donation as part of their Facebook game, “Build a Better Easter Basket with Lindt GOLD BUNNY.” The company will donate a dollar for every single puzzle piece found in the game. The second donation comes from the sales of the chocolate versions of the Lindt gold bunny. For every chocolate bunny sold, the Swiss chocolatier plans to donate 10 cents. 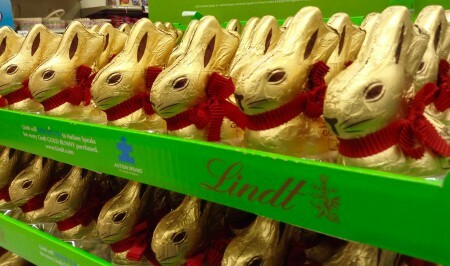 Shoppers in stores will see the puzzle piece associated with Autism Speaks on displays for the Lindt chocolate bunnies. Along with the puzzle piece, there will be a printed notice that a donation will be made for each bunny purchased and a link to the Autism Speaks website. Since the first Lindt celebrity auction six years ago, the company has raised over $600,000 to benefit Autism Speaks. The money raised over the past six years has gone to support advocacy, awareness, research and family services. Autism Speaks is one of the largest advocacy organizations for autism in the world. The company’s goal is to not only raise the public’s awareness of autism but to also give families the resources and information that they need in order to help improve the lives of those who are affected by autism. One in every 88 children in America is diagnosed with autism. It is considered to be one of the fastest growing developmental disabilities in the country. The funds from this year’s Lindt partnership, will go towards educational kits supplied to families who have a new diagnosis of autism, funding for scholarships to educational facilities and community program grants. The Lindt celebrity gold bunny auction to benefit Autism Speaks runs until March 20, 2015. Lindt’s goal with their Facebook promotion, is to raise up to $12,500 with the support and participation of the social media community. The company’s fundraising efforts for Autism Speaks run until April 20, 2015.